LULAC GLANCES ATTENTION ALL LULAC MEMBERS AND INTERESTED AMERICANS LULAC MIDWEST CONFERENCE Saturday APRIL 12, 1969 HOTEL BLACKHAWK...DAVENPORT, IOWA Present will be Roberto Ornelas, LULAC National President. ALSO Planning to Attend will be National Vice-President, Narcisa Espinonza from California. Ornelas is from Houston, Texas. The State Directors of the five Midwestern States will also be present. Delegates from Iowa, Indiana, Wisconsin and Minnesota will also participate in the conference. LULAC Council #10, of Davenport, Iowa, will be host Council. The following is a short form agenda: 9:00 A.M. - 10:30 A.M... Registration 10:30 A.M...Begin Business Session 12:00 Noon...Noon Luncheon 1:30 P.M....Meeting Reconvenes 4:30 P.M...Adjournment 5:00 P.M...Social Hour...LULAC Clubroom, 325 Perry St. 6:30 P.M...Banquet..(Buffet Style)...Hotel Blackhawk 9:00 P.M...Dance...Eagles Danceland..."LOS REALES" THE COST OF REGISTRATION IS $10.00. THIS ENTITLES ONE TO THE BUSINESS SESSIONS. THE LUNCHEON AT 12:00 NOON. THE SOCIAL HOUR AT 5:00 P.M. THE BANQUET AT 6:30 P.M. AND THE DANCE AT 9:00 P.M. TO 1:00 A.M. LOS REALES WILL PLAY FOR THE DANCE. BANQUET AND DANCE TICKET ONLY $5.50 PER PERSON. 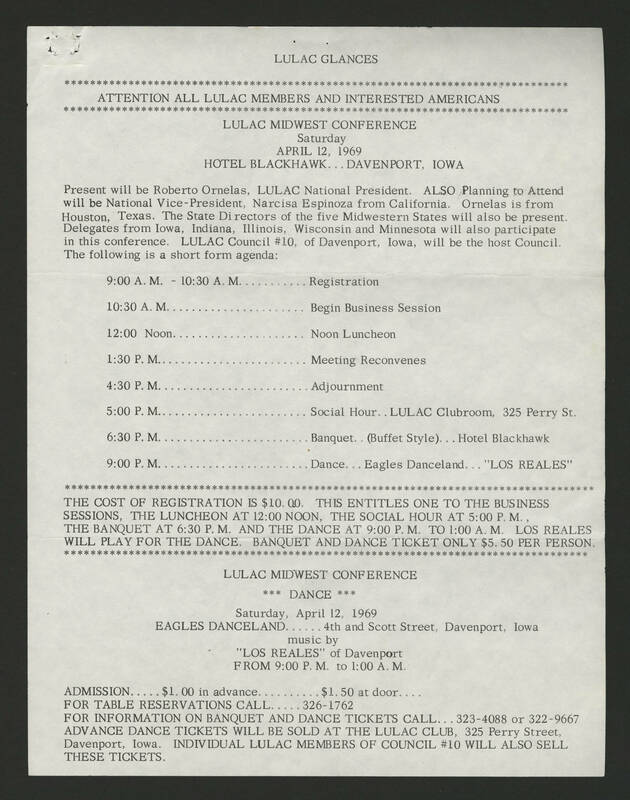 LULAC MIDWEST CONFERENCE *** DANCE *** Saturday, April 12, 1969 EAGLES DANCELAND...4th and Scott Street, Davenport, Iowa music by "LOS REALES" of Davenport FROM 9:00 P.M. to 1:00 A.M. ADMISSION...$1.00 in advance...$1.50 at door... FOR TABLE RESERVATIONS CALL...326-1762 FOR INFORMATION ON BANQUET AND DANCE TICKETS CALL...32304088 OR 322-9667 ADVANCE DANCE TICKETS WILL BE SOLD AT THE LULAC CLUB, 325 Perry Street, Davenport, Iowa. INDIVIDUAL LULAC MEMBERS OF COUNCIL #10 WILL ALSO SELL THESE TICKETS.